The exhibition by Camilo Bojacá (Sogamoso, 1985) in the Projects Room presents a selection of works that explore the concept of predation, understood as a normalized behavior within our culture. The natural landscape becomes an economic landscape, as a result of the action of mankind, who seeks to usufruct it and consume it. It is almost inevitable that every natural landscape is perceived as a potential economic landscape waiting for the arrival of human action to experience it and change it. 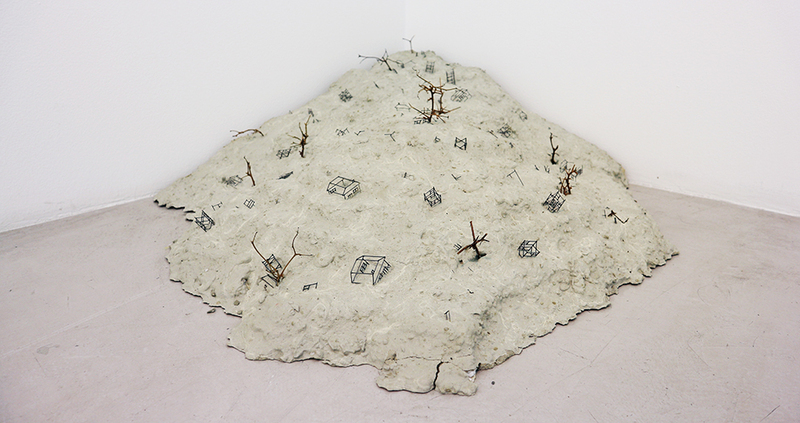 Bojacá’s work explores the relationship between consumption, exploitation and transformation of natural resources, presenting both sides of the coin. On the one hand, he is interested in capturing the vulnerability of nature and how it is defenseless in the face of human intervention. On the other hand, he shows in his drawings the farmer as a guardian of nature who, metaphorically and literally, carries it on his back. Through his pieces, Bojacá is interested in understanding the diverse notions of the landscape, seeking to transcend an aesthetic look in order to view its multiple layers that become the economic, social, cultural and consumer landscape. His work is characterized by the use of diverse analogous techniques such as drawing, watercolor and installation, where he plays with the scale, in order to emphasize the fragility of the ecosystem in the face of the imminent devastation and the contradictory forces that make the development of the economy and the growth of humanity possible.